The week before Thanksgiving the Wellness Wednesday post featured a piece on being thankful for health and how I was challenging myself to 600,000 steps between the months of November and December. As a brief update to that I'm currently at 403,972 steps and about 20,000 above where I need to be to reach 600,000 by the end of the month! Today I'm sharing a bit more about health but maybe in a way that you wouldn't think. I'm sharing about our facial cleanser and moisturizer! One of our largest body parts is our skin and taking care of that is just as important to me as taking care of the rest of my body. Afterall what's deposited on our skin makes it way into our body. If I'm putting my health first and challenging myself to reach a step goal then I want to make sure the rest of my body is coming first too - inside and outside! Over the past five years or so we have been making small lifestyle changes that have come to make up something very different than how we were living after college graduation. I don't want to describe it as a radical change because it's not. From the outside looking in, we seem like normal folks but we're probably more on the end towards health nut but not completely since we believe in "everything in moderation." Now I might seem like I'm veering off track a bit if this post is going to be about facial cleanser and moisturizer. But in some ways I need to share about making these small lifestyle changes that preceded swapping out department store beauty counter cleaning products for a more natural, local product. So some of those first few lifestyle changes we made were ordering produce a farm CSA subscription and cooking more at home. Once we had adapted to those changes and a few more I began to look for other lifestyle changes that would reflect putting our health first. 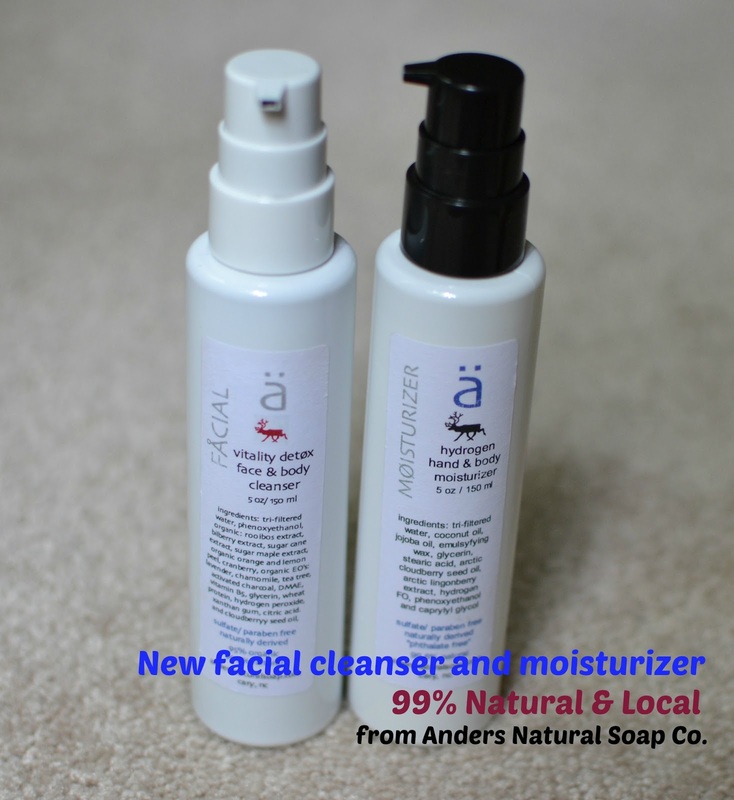 One of the changes was then replacing our facial cleanser and moisturizer. Between the two of us we were using a combination of Clinique and Clean & Clear products. 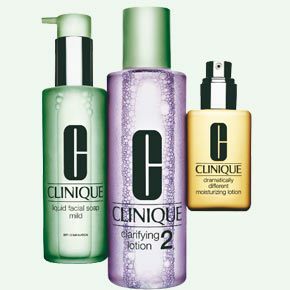 I had actually been using the Clinique 3-step cleansing program since middle school. I really had no fault with it but if I could find a more natural alternative then I wanted to switch. Then I read the back of the bottle and it said the product was flammable! I didn't want that on my skin! My research brought me to the Skin Deep Cosmetics Database from the Environmental Working Group. They are a "a non-profit, non-partisan organization dedicated to protecting human health and the environment." This Skin Deep database contains information on thousands of skincare products and rates them on a hazard scale. Personally I'd like to make sure everything that's going on my skin is low hazard. Unfortunately the majority of Clinique products aren't in the database but there are some and the ratings ranged between 2 and 6. There are enough concerns with the ingredients in the Clinique products that I'd rather stop using them and find a safer alternative. "We started our business in 1999 out of a desire to supply our naturally made products into the marketplace. We started making soap around the mid 90's as a craft that later grew into a business. Our soaps contain only: olive oil, palm kernel oil, coconut oil, essential oils, fragrance oils, and no animal products. We use only natural additives: kelp, oatmeal, hemp seed oil, borage seed oil, natural extracts, stone ground grits, etc. and no synthetic dyes, only natural colorants in several different soaps." Not only are they using natural ingredients but they're local. It wasn't too terribly important to me that the product be local but if I can support a local business then that's a win-win scenario. We've been using them for three or four months and have been enjoying the product. Patrick and I are using the same facial soap and moisturizer too. Who knows, maybe we actually are crazy liberal yuppies?! But I do know that I want to live to be one hundred and have Patrick by my side in our rocking chairs. Our small lifestyle changes with a nod towards our health seem to be the best way to do that! Awesome post! Always glad to see these small changes that can make such a big difference! This was so interesting. I am going to make some changes, too.